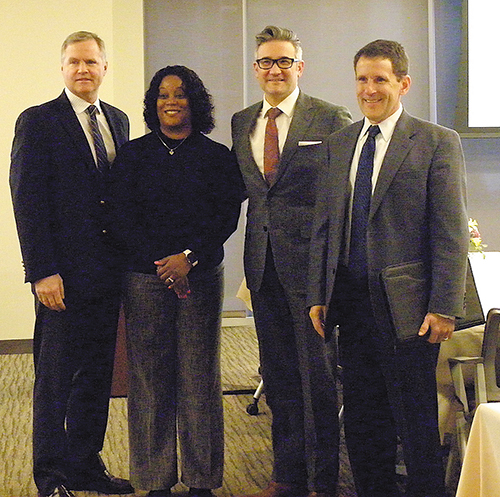 (L-R) Michael Neuser, chair-elect of Programs, Brandee Norris, chair-elect of Membership, speaker Dr. Alexander Langerman and Dr. Tim Jahn, guest from Kentucky. The American College of Healthcare Executives Middle Tennessee (ACHEMT) gathered at LifePoint Health on Feb. 28 for an informative program on healthcare today and the future of surgery. What you do matters every day. When we make a mistake, somebody - the patient and also the family - pays the price. If you are not committed to continuously improving the quality of care, then you should leave the business and do something else. Noting we have all been consumers of healthcare, Giovanetti said those experiences have informed his own responsibilities, and those for whom he has responsibility. He shared his personal story about the diagnosis of his brother, Tony, at the age of 48, with Type A Leukemia. The treatment required a stem cell transplantation from their sister. Unfortunately, graft versus host disease followed. Giovanetti said he felt at a deep loss as to how to tell his brother that he was going to die and how to tell their father, who had recently lost his wife, that he would lose his son, too. Giovanetti enlisted an oncology nurse to help communicate the news. He said we have a tremendous opportunity to show that we really care about the people we serve, the patients and also their families. Patients assume, but also deserve, to get more than good quality care. Having been on both sides, Giovanetti said what really matters is that patients and families feel cared about and cared for and that, as providers and system executives, we listen and respond. He drew attention to four key elements of leadership - formal training, experience, talent and lifelong learning. Building on that foundation, Giovanetti called on those gathered to find something worth learning in every situation. The event's second speaker was Alexander Langerman, MD, SM, FACS, associate professor of Otolaryngology and director of Surgical Analytics Lab for Vanderbilt University Medical Center, who is the founder of ExplORer Surgical Corporation. With a mix of confidence and humility, Langerman captivated the audience with his passion and commitment to improve the quality of care. His presentation covered four key topics. Langerman said one of the main challenges facing surgical environments today is balancing versatility with specificity. Structural equipment needs change with each clinical task with some tasks requiring significant infrastructure and complex devices. Yet, too much specificity, he noted, could adversely limit the extensibility of the space needed. The long-standing way of organizing, noted Langerman, is to use a preference card. However, there is significant inefficiency with the lack of certainty as to preferences. Staff fear being reprimanded if the layout isn't correct, patient harm is possible if the wrong instrument or material is inadvertently selected, and delays occur when needed instruments are not present. Conversely, overprovisioning also causes problems including waste from open-but-unused instruments that some estimate to be a multibillion-dollar annual loss healthcare, as well as cognitive overload from the overwhelming number of unnecessary supplies arranged on the surgical table. Langerman shared his own results from an institution-wide tray reduction effort where seven trays with more than 400 instruments were reduced to two trays - one universal and the other contingency tray with 60 specialized instruments. He noted the challenge in improving efficiency and quality by reducing variability relies on collecting better data. The first hard data on redesigning operating rooms for efficiency came out of a study performed at the Clemson School of Architecture's Center for Health Facilities Design & Testing (RIPCHD.OR). While healthcare facility design has moved toward the use of lots of booms, Langerman said what is not taken into consideration are logistics, such as whether or not a surgeon can see the clock on the operating room wall, poorly thought out trash flow or poor placement of a vital monitor. Langerman showed how these impediments could be identified with real-time simulation using full-sized, mocked-up operating room spaces. An early example was Frank and Lillian Gilbreth's Surgical Motion Studies if the early 1900s, which has evolved into the "OR Black Box" project at the University of Toronto where everything happening in the operating room is recorded and analyzed. Langerman said the next horizon will be automated analysis using artificial intelligence techniques. To increase efficiency and quality in surgery, Langerman said we need to create technological and environmental supports for enhanced teamwork. Most surgical care incudes fractured teams as a result of breaks, handoffs and cross-coverage. When the operating room staff is 100 people, there are millions of potential combinations, which means many teams lack situational awareness and a consistent "game plan" for the surgical intervention. While medical interoperability is an important trend in healthcare information technology, Langerman said the focus also needs to be on "human interoperability." How does information get into and out of information technology systems via the human participants? Considerations include tailored information for decision support, cognitive hierarchy and inclusiveness to the patient to meet the ultimate goal of making spaces better for patients. One of the critical incoming trends in healthcare is transparency. Consumerism, increased liquidity of data and the erosion of trust in professions, including medicine, alongside the growing publicity of conflicts of interest and "bad behavior," combine to create an expectation that hospital processes be transparent. Langerman noted the modern-day operating room is one of the most secluded of environments in the hospital despite being critical to patient care and quality improvement. Recently, there has been a push for more transparency. Langerman said while there is still much opposition, the "pulling away of the curtain" in surgery is gaining public support. However, he said there is a delicate balance between offering patients and physicians access to a procedural video and a video of the surgical team, which could lead to burnout and a need to 'perform' for the camera. This concern was underscored by a study examining the response of TSA employees to "coercive surveillance," causing depersonalization and adverse behaviors as a result of cameras at work. 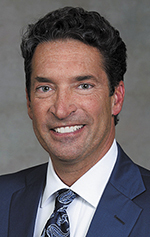 Ultimately, Langerman said the future of surgery will entail a balance of technology, creative space design and environmental supports to provide an enhanced operating room that advances human teamwork and medical interoperability and transparency with the goal to not only continuously improve the quality of surgical care, but also to improve patient experience. Students interested in a corporate healthcare career are encouraged to attend the upcoming college event at the Tennessee Hospital Association on April 24 from 6-7 pm. To register for the free event, go online to achemt.org. David Weil, Esq., MBA, serves as vice president of Legal Services for QUORUM Health and as chair of the Membership Growth Subcommittee for ACHMT. For more information on the organization, go online to achemt.org.